This recipe is for those who have pasta & find out last minute that they don’t have their sauce! GASP ! & all you have is a can of tomatoes… or nothing at all. Haha. Well if this hasn’t happen to you.. it happened to me. I was at the time making ravioli. This sauce is great for any kind of pasta: ravioli, spaghetti, etc. It’s affordable & simple. It’s great especially for us college students who don’t want to buy a large container of pasta sauce. It has just the right amount of sweet and tarte. Enjoy! Stir until a boil and then turn off your stove. Optional: If you decided to add any meat into the sauce.. start with step 1-4 and then brown the meat. Afterwards, continue on with step 5. 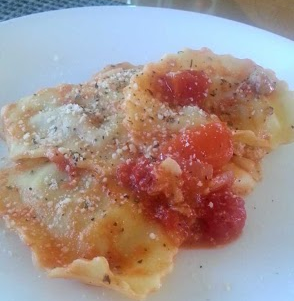 I bought pre-made ground turkey ravioli which I boiled & then poured the delicious sauce right onto the top. I added additional pepper, parmesan cheese & parsley flakes.